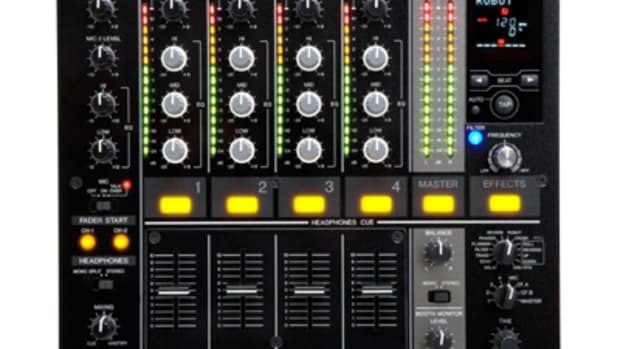 The Pioneer DJM-350 two-channel professional mixer has some cool unique features and seriously high quality manufacturing. This mixer is packing on-board effects and USB recording functions. Pioneer sent me a DJM-350 and I had to send it back just in time for NAMM 2011 so I could give you this Full Written Review and Video Inside. 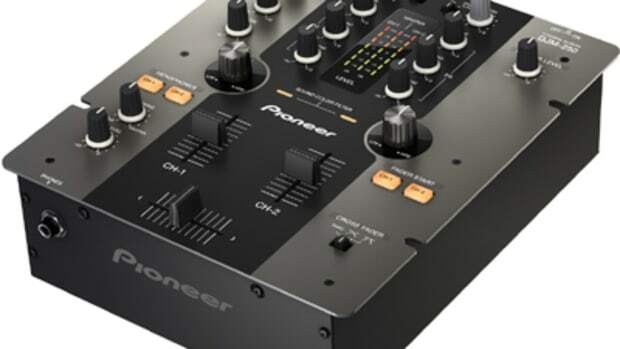 The Pioneer DJM-350 two-channel mixer is the entry-level mixer in the Pioneer DJ lineup; but there isn’t much “entry-level” about it as everything from sound quality, price, build, and features all stack up against mixers in the professional category. Pioneer has been known as the standard when it comes to professional club DJ setups and no one can deny the reliability and ease of use associated with their DJ Products. 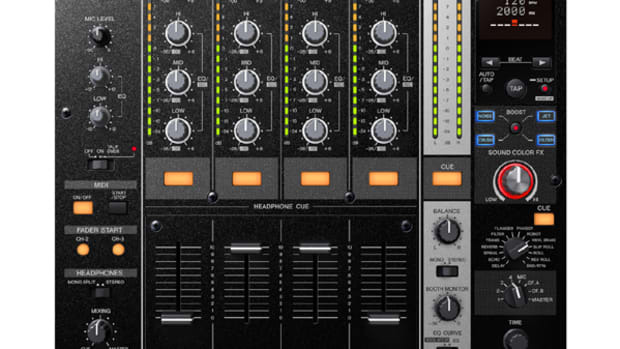 It’s easy to see that the Pioneer DJM-350 takes most of the same internal/external components and construction from the Pioneer Club standard mixing consoles. Even though the Pioneer DJM-350 is smaller and lacking some features that its bigger and more expensive siblings possess, this two-channel mixer is still very powerful and versatile with features that set it apart from most others. 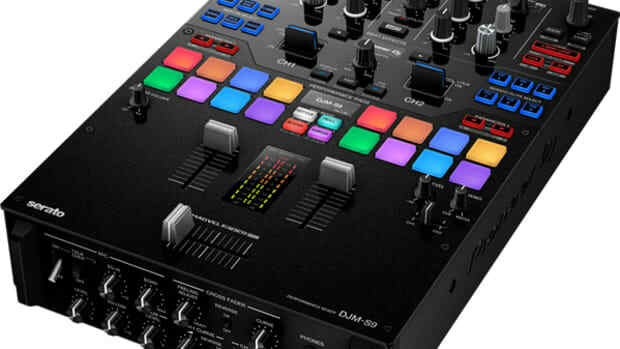 Even though I only have a couple of weeks to review the DJM-350 before it is sent back to California for the NAMM 2011 DJ show, I was able to get a great feel for the mixer and a good idea as to which DJ’s would benefit most from this mixer’s abilities. The setup process for this mixer was straight forward just as with any other mixer. I used the RCA connections from my Traktor Audio 4 interface and connected them directly to the LINE inputs on the Pioneer DJM-350. For this test, I used a set of Denon DN-S3700’s along with the Pioneer DJM-350, all running on my Traktor Scratch Duo desktop. There are a total of two master RCA outputs along with a PHONO and CD RCA input per each channel. I am a bit disappointed that they did not include an unbalanced output on such a great sounding mixer, but the RCA outputs do a great job while they were connected to my Crown amplifier and (2) twelve inch Peavey speakers. There is an additional AUX RCA input on the back so the DJ can hook up any other audio device, essentially creating another channel for the DJ to mix and play with. There is a ¼” MIC input on the back and a ¼” headphone input jack on the front. Build & Construction – The tried and true construction and build materials that Pioneer uses in mostly all of its DJ gear is on great display with the DJM-350. This mixer is built SOLID. Every single piece of material on the Pioneer DJM-350 can withstand punishment and abuse for years to come. The faders, knobs, switches, and buttons all have a quality about them that let the DJ know that this is not a toy. The mixer itself has an all-steel construction and the overall weight is a lot heavier than it looks (don’t let the small form-factor fool you). The DJM-350 is the perfect size for Mobile DJ’s and DJ’s that are constantly on the move. It can also double as a really strong backup mixer in any professional environment. Or it can serve as a primary mixer for all levels of DJ’s that just want something strong to last them through the years. Just as with the whole Pioneer DJ lineup, I would trust this mixer with my life in the reliability department. All of the knobs are made of a very hard plastic that can feel somewhat jagged at times, but they do a great job of fine tuning certain adjustments. The big face buttons on the Pioneer DJM-350 are made of a very hard material and they audibly click and illuminate so the user knows what is currently activated. The switches are very mechanical and sturdy making the selections absolute. 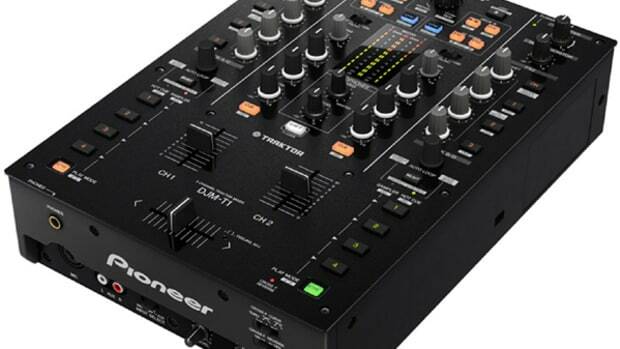 The Faders (And Scratching) – The Pioneer DJM-350 has some really strong and sturdy faders. The volume levels of the line faders can be adjusted spot-on to what the user needs. There is no line fader curve control or reverse function here, so they will be used for mostly mixing. For the crossfader, there is a Curve adjustment switch located directly above the crossfader which can be set to THRU (no crossfader control for line fader mixing), soft (for crossfader mixing), or sharp (for scratching). The crossfader does an excellent job right out of the box for mixing purposes. However, the crossfader doesn’t perform so well when it comes to scratching. Many people believe that when a mixer has two-channels and a crossfader curve control that it must be suited for scratching, but this is one of those mixers that does not fall into that category. Don’t get me wrong here…a DJ can scratch with the DJM-350 but there are some issues that will arise once things get a little more advanced. For example, every time I tried to perform Crab Scratching on both sides my fingers would get hung up on either the effects knob on the right or the headphone volume control knob on the left. Furthermore, when my DJ brother and I were scratching, the recessed crossfader curve control switch would also get caught up on our fingers to the point where the switch would land in-between settings causing sound issues. And lastly, the crossfader cut-in travel distance was nearly double that of what other mixers on the market are usually showing. Even though the fader can be easily modded to correct this issue, the normal cut-in travel distance is about 2mm, while the DJM-350 crossfader had about a 4mm distance even at the sharpest curve setting. It may not sound like much, but anyone who does serious scratching will feel it in an instant. All is not lost however, as the DJM-350 is compatible with the DJM-400 model Innofader for those DJ’s out there that want to upgrade for scratching purposes. The DJM-350 wasn&apos;t really created for scratching in the first place, so if a strict turntablist is looking to purchase a mixer with the sole intent of scratching, they may be better suited elsewhere. So, to sum it up, the faders are built very strong/reliable and are perfect for mixing, but they are just OK when it comes to scratching due mostly to the layout of a mixer that had to pack a bunch of other features into this compact package. EQ/Cue – The three band EQ on each channel is very nice on the Pioneer DJM-350. They all provide excellent sound quality and total kills when turned all the way down. Each channel also has its own gain control knob at the top of the EQ controls. The Cue section is found on the lower left corner of the mixer. Directly above the headphone input is the volume control knob and the Mix/Cue adjustment knob which the DJ can use to monitor the mix before going live. There are big buttons with LED lights labeled CH-1 and CH-2 which can be activated to listen to the corresponding channel through the headphones. The headphone output on the DJM-350 is very strong and is easily suited for the club or pro-audio applications providing high levels of volume when needed. Aux/Mic Controls – The DJM-350 also has an AUX RCA input which can serve as another “channel” when mixing. This can be used to playback any other Line input such as MP3 players, CDJ’s, etc… The only catch is that the DJ can only use either the MIC input or the AUX input at any given time. They cannot be used simultaneously as the toggle switch at the top has to select one or the other. There is another big button just above the cue section of the mixer labeled MIC/AUX ON which will illuminate the LED when the input is active. The MIC/AUX input has a two-band EQ consisting of a knob for LOW and a knob for HI audio adjustments. It also has its own volume control knob. USB Record/Playback – This may just be my favorite feature of the Pioneer DJM-350. On the top right of the mixer there is a USB port. This USB port can be used for recording the Master output onto flash drives or hard drives in WAV format. To start a recording, simply press record and then press the play button to stop the recording. A track marker can be set to start the beginning of a new “track” of the recording. To set a track marker, simply press the record button while the unit is already recording. After these track markers are set, the user can now navigate through them using the preview, next, and previous buttons. The user can playback the recordings through the headphones only. Recordings cannot be played through the master output straight from USB. This feature worked very well and the sound quality of the recordings came out great. Effects – Under the USB recording features and the Master Volume control knob is the effects section of the DJM-350. There are a total of four different effects found on the mixer which are Gate, Jet, Crush, and Filter. The Effects are activated by pressing the corresponding button of the effect the user wishes to engage. The LED will light up on the active effect. The effects cannot be chained together. In order to control the parameters of the effects there is a Level/Depth knob located below the effect buttons. The effects worked very well and were definitely fun to use. 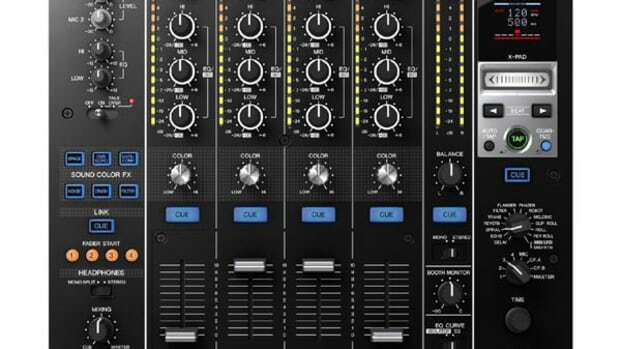 The Pioneer DJM-350 is a very good mixer. I love the rugged-ness of the unit and the all-steel chassis that is sure to last for years and years. The faders, switches, buttons, and knobs are all made of high quality materials and just feel sturdy. Pioneer has always been known for excellent club-quality sound performance, and the DJM-350 is right up there with its pricier siblings. The onboard USB recording and effects make this mixer a nice versatile package to suit all types of DJ’s. The gripes I have with this unit are the lack of unbalanced outputs, the relatively high $600 price tag, and the lower-than-hoped-for scratching performance. Even with these slight shortcomings, the DJM-350 is still highly desirable as it still has features not found on other mixers in a nicely sized package. 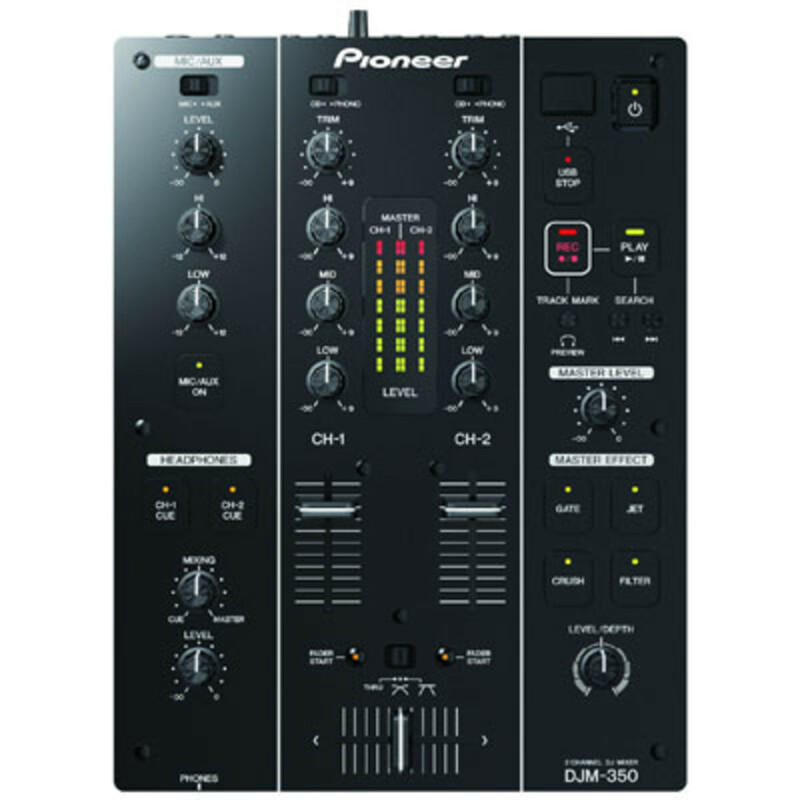 I recommend the Pioneer DJM-350 for DJ’s who love to mix and want to throw in a little bit of scratching every now and then. It’s also recommended for DJ’s who need on-board USB recording and a few effects to make things interesting. It would be perfect for the mobile and traveling DJ’s out there who want something small to travel with and also for the club owners who just need a compact backup rig that still feels "Pioneer" familiar.